This Skyhook is a kite power optimizer designed for use with the Flexiwing Delta Kite. The skyhook is connected to a cord which is fitted into the kite line, this cord has three loops for connecting the skyhook tail rope to. 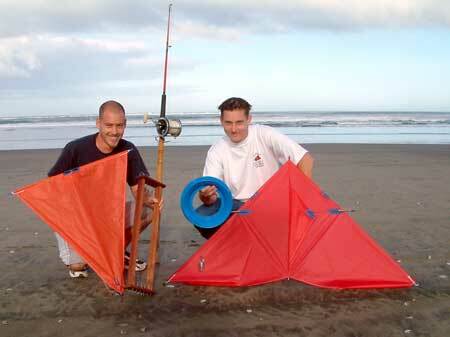 The skyhook kite sail can be adjusted to give more pull or more tacking angle into the wind, depending on which of the three loops the tail rope is connected to. It is really a sail kite that cannot fly on it's own but, when flown under a kite, it almost doubles the working area of kite sail. This skyhook increases the available pull and allows larger loads to be towed offshore in lighter winds. When the tail rope is connected to the top two loops the skyhook pulls the kite further into the wind and increases the angle of tack into the wind. In light winds delta kites can sometimes spend a lot of time gliding without developing useful pull. In these situations the tail rope of the skyhook kite sail is connected to the bottom loop. Note : The Flexiwing skyhook is the triangle shaped kite sail on the left of the photo. Other products are shown for scale only and are not included. On the lower setting the glide cycle is reduced because the kite sail quickly pulls the kite back and into the wind. In the pic on the left the three adjustment loops can be seen under the right top leading edge of the kite sail. Some practice is required to become proficient with the skyhook kite sail but the benefits are well worth the effort. 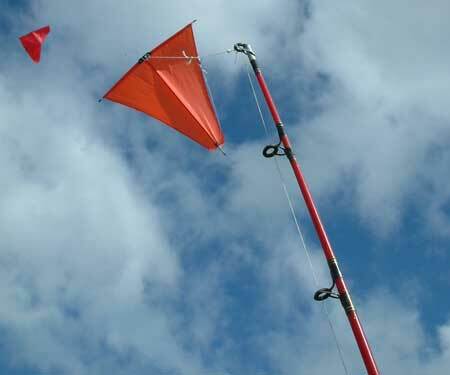 Paul has successfully fished a kite/skyhook combination in winds blowing 10 to 15 degrees onshore! Note : Kite power optimizer designed for use with the Flexiwing Delta Kite, does not include rod, reel, flexiwing kite, large handspool or trace rack.